What do the best beer bars do during their holiday days off? Improve and plan of course! Falling Rock is back from a quick holiday break and already they've got some new improvements and plenty of plans ahead for January 2013. Here's a copy of their latest newsletter with some news of interest to craft beer drinkers direct from the owner Chris. Friday January 4th 5:30pm - Odell Lugene Kickoff Party. This new Seasonal offering from Odell Brewing is an 8.5% Milk Stout with Milk Chocolate. From the label “If you've ever been to our brewery, you've likely seen the old, beat-up truck that hauls away our spent grain. (That truck belongs to Lugene, who’s been feeding his dairy cows the hearty malt for over a decade. Named in his honor, Lugene Chocolate Milk Stout is brewed with milk sugar and milk chocolate. (The rich and creamy brew reminds us of a cold glass of chocolate milk and our hometown “Aggie” roots)”. Sunday January 6th 2:00pm Cantillon Kriek Tapping. I usually don’t tap a keg of Cantillon til I have the next one in the bar, but since it’s been 4 years since I've received one I’m gonna blow out my last one. I remember 15 years ago ordering Cantillon beers, back when our local distributor (not a particularly good one) would only order from that importer twice a year, and needing to order enough to last me close to 6 months, they weren't cheap & things were a bit leaner then, and I prayed the utility company wouldn't call for a few days after we paid for the order. Fast forward 15 years later & things have progressed, we now have a good Distributor, theoretically we have a sales rep in the state, but I can barely get any bottles of their beer & it’s been 4 years since I've seen a Keg. Despite all this I still Love Cantillon’s beers & this keg is particularly tasty (I had to try it out the other day to make sure it would pour correctly & still taste acceptable) Come on out & let’s enjoy it, if it blows quickly, don’t worry, I’ll tap into something else tasty & sour like one of Russian River’s Sour Beers, let’s see, now which one is back there. Thursday January 17th, 5:30pm. Alaskan Smoked Porter Vertical. We’re breaking out kegs of Alaskan Brewing Company’s Classic - Smoked Porter. We have kegs going back to 2009, so come on down & check it out. It’s not often that you get to try multiple years of this on tap, but we saved some just for this kind of event. Thursday January 24th, 5:30pm. Avery Czar Vertical. I went into the stash & pulled out kegs of Avery’s Czar Imperial Stout. How far back you might ask, we will have every year of Czar back to 2008 (that’s 5 years worth). Once again It’s a rarity to get this kind of vertical tasting, come take advantage of it! Saturday January 26th, Noon-6pm. Vintage Beer Sale. It’s been a few years since we've done one of these & my cooler looks like it. We've got a few too many bottles of different vintages in our vintage cellar so what’s a poor Publican to do but put it on sale & move it on out. We’ll put up a big dry-erase board of all the different beers we’re clearing out & the quantity available for purchase (at substantial discount I might add) as we sell one we’ll update the board & countdown till we’re out. Tasty, well cellared beers will abound. JANUARY - ALL MONTH LONG. As you may have guessed we are going through our cellar & using it for its intended purpose, to give our customers special treats not often found (let’s just say that accountants REALLY hate this ‘Cellaring Beer’ concept, that & because it takes up so much room is why so few places really do it, especially to the extent we do). All month long we will have a few dedicated ‘Cellar Taps’ just to go through some of these beers, there are some truly amazing things hidden in the back… Want to know what we've just tapped? 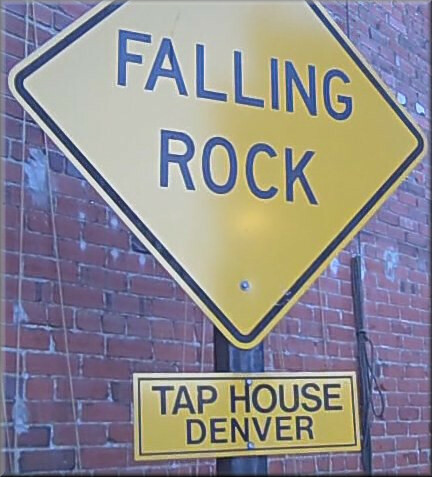 Follow us on Twitter ( @FallingRockTap ) & get the latest tapping Info. - Falling Rock's 2012 GABF events.